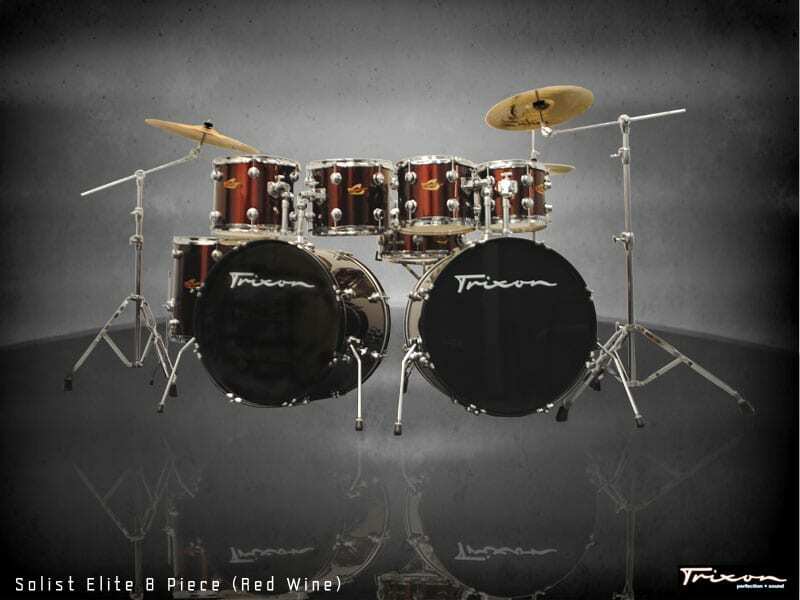 This is the rampaging Trixon Soloist Elite Arena Kit. Have you left the drone of the 9-5 lifestyle completely behind for late night headlining shows? Do you eat, sleep and won’t shut up about drumming? Are you changing drum heads more than you change your clothes? We understand why you wake up in the middle of the night and have to get those beats out. That’s why we built this kit. 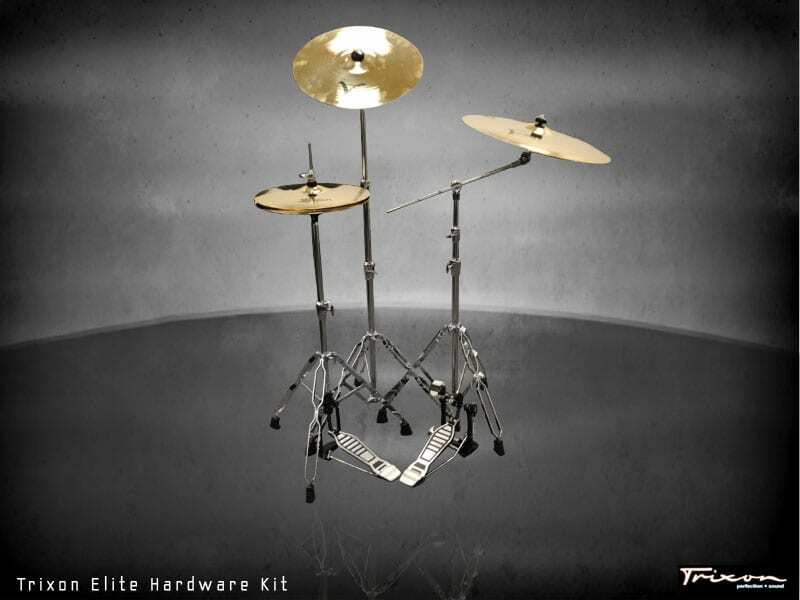 This kit includes all our exclusive Eastern Yellow Birch toms, snares and bass drums, our exclusive Low Mass Multi-Point Cylinder Lug Technology™ drum hardware, our Solid-Lok™ hi-hat hardware and our Heavy-Duty drum pedal hardware. Keep reading for detailed information on this kit! Trixon snare shells are made out of six-ply Eastern Yellow Birch Wood. Eastern Yellow Birch is a straight and has a close-grained texture. It has a density of 44lb per 3′ and is a popular wood for high-end cabinet making, flooring and furniture. Each shell layer is pure Eastern Yellow Birch. The layers are laminated using high PSI steam and low glue volume for a melodic and rich sound. Trixon Yellow Birch Shells feature a a trademark secret blend of glue that reduces the volume needed in it’s laminate shells therefore increasing the amount of wood available for producing sound. Our shell hardware uses Low Mass Multi-Point Cylinder Lug Technology™. This technology allows for a single cylinder lug attached to the absolute middle of the drum shell to be anchored into the shell by multiple attachment points. The natural physics of our low mass cylinders direct tensioned-energy equally into the multiple mounting points on the lug. The arrangement of this hardware in relation to the shell minimizes the amount of metal-through-wood contact and maximizes sound producing area. Multiple point anchors assure equal drum head tension throughout the snare. Trixon lugs, hoops and tension rods are CNC designed and created with our Infinite Tuning Technology™. The ability to tune the drum head to an almost infinitely desire of tension without fear of stripping the rods allows the players a greater range and the ability to tune for different sounds. Triple-flanged hoops are hardened internally before being TIG welded, chromed and laser cut for the tension rods. You want absolute control of your hi-hats and Trixon knows this. This is why our cymbal stands are built for durability and easy adjustment. We start with boxed-formed steel hardware for the legs. By using four corners in the diameter of our bracing legs we greatly increase the thickness and balance of the stand. A 1” tube diameter along with multiple Solid-Lok™ height and tilt adjustment allow micro-adjustments for just the right height and angle. Trixon believes that even the rubber feet are an important part of the stand. That is why we engineered our rubber feet with radiated fins. This allows for solid plantation onto any hard surface and into any soft surface. We design our stands to be played constantly under extreme conditions! Our heavy-duty dual-chain pedal assembly is the ultimate in hi-hat and drum pedal control. We begin with a pedal that is locked into place by the way of dual rails. When your foot reaches for the pedal it will be in the exact same spot every time. The pedal is articulated by a greased rod-and-pin at the base that can stand up to the dirtiest of environments. Attached to the top of the pedal are dual, non-stretch chains designed under the same standards found in sport motorcycle bikes. Our chains are designed for high-tension abuse while still allowing for micro control of the hi-hats and bass drums. Most importantly for our fans and players of Trixon Snares is our quality control process. We use X-Ray technology and random selection to ensure that every drum we produce is of the highest quality. We pride ourselves in being able to produce drums and incredible quality for players on honest budgets.